The insurance needs of parents and young adults vary. Young adults are often in good health with no dependents, while parents are responsible for a household of two or more people. In addition to traditional life insurance, there are other types of insurance policies that parents and young adults should consider. As a parent, there are several types of insurance for you to consider purchasing for yourself or for your family. For example, although you may already have life insurance, you may want to purchase a supplemental term life policy to pay for your lost wages while your children live in your household, such as Gerber Life’s Term life insurance. This will help to ensure that your kids can continue to enjoy the lifestyle they do now, and also that your lost income will not prevent them from participating in extracurricular activities or attending college. Another type of insurance policy for parents to consider purchasing is a whole life policy for children. When purchased during early childhood, for example, premiums can be as low as a few dollars per month. If you and your child continue to pay for it for life, the policy will gain cash value, as long as premiums are paid. For example, The Whole Life Plan from Gerber Life grows in cash value over time – and could grow to equal the amount of the death benefit at age 100. Other types of important insurance for parents include health insurance, accident protection insurance and terminal illness coverage. These types of policies can protect you and your children in case of a medical circumstance that limits your ability to financially support your household. Young adults may not need large term life insurance policies, but there are other types of insurance coverage that may be beneficial. For example, health insurance can prevent you from accumulating medical debt in the event of an accident or illness. If you are in good health, consider purchasing a major medical policy or find out if you qualify to remain on your parent’s insurance plan as a dependent. You may also want to purchase accident protection insurance, such as The Gerber Life Accident Insurance Plan, which helps provide financial protection against accidental death or a covered disabling injury. Whether you become injured in an auto collision or need to be hospitalized for a long period of time, this accident insurance coverage can be used to help pay for out-of-pocket medical costs, lost wages or other expenses. If you are a pet owner, pet insurance is an increasingly popular type of policy among young adults. Many single and newly married young people opt to care for pets as household companions, but just one large veterinary bill can cost two or three weeks worth of income. 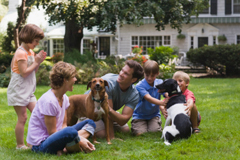 Pet insurance provides similar benefits to health insurance for humans, ensuring pet owners never have to paid high out-of-pocket costs unexpectedly. You can find pet insurance on the private market, although some employers also offer the coverage as a part of a benefits package. Whether you’re a parent or a young adult, it’s always important to do your research and compare insurance policies before determining which one may be right for you.